The SB Newborn Fitted Rental Package has a complete set to full time cloth diaper a newborn baby up to 5Kg (12 lbs) using Newborn Fitted diapers. 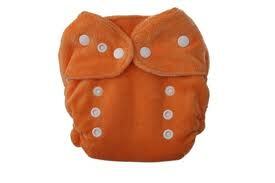 You'll receive 12 Thirsties Fab Fitted Newborn Diapers. And you'll have 12 weeks from the time baby is born to use this rental package. Why Thirsties for this package? Because they are absorbant and the easiest diaper to handle. Plus you wanted the most breathable diaper for you baby. The payment required to rent the SB Newborn Rental Package is RM300 (RM150 to rent + RM150 deposit). You'll have up to 12 weeks (once baby is born and I ask that you rent not more than 2 weeks before your due date) to use the package and then once it's returned, you'll receive a full refund of your deposits (RM150) PLUS RM10 Gift Cert for your next purchase. If you're in Petaling Jaya or Kota Damansara area, you're welcomed to drop off the package. And if you're mailing it back, I suggest including tracking and insurance to protect you in case the diapers get lost/damaged in transit. Because of the already built in discount, additional discounts cannot be used on this package. The price RM300 does not include shipping cost.